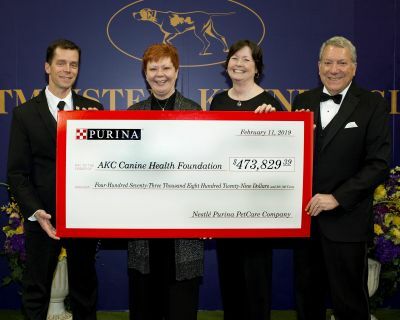 RALEIGH, N.C. (February 12, 2019) – The American Kennel Club Canine Health Foundation (CHF), a nonprofit organization whose mission is to prevent, treat and cure canine disease, announces that Nestlé Purina PetCare has donated $473,829.39 to support canine health. The gift was presented to CHF Board Chairman Dr. J. Charles Garvin and CEO Dr. Diane Brown at the Westminster Kennel Club Dog Show on Monday, February 11. 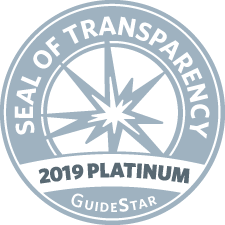 The Purina Parent Club Partnership (PPCP) enables Purina ProClub members to designate a parent breed club within the program, earn Purina Points by purchasing qualifying Purina pet foods, and submit proofs of purchase to participate in the program. An annual donation from Purina is shared between the parent breed clubs and their Donor Advised Funds at CHF. Since it began in 2002, PPCP has provided approximately $8 million for canine health research, breed rescue and/or educational efforts to positively impact the general well-being of dog breeds. Again in 2019, parent clubs will have added incentive to put their CHF Donor Advised Funds to work for canine health research by participating in a matching-gift opportunity called C.H.O.I.C.E. (Canine Health Opportunity to Impact CarE) through CHF. In addition to PPCP funds, Nestlé Purina also supports CHF as a corporate partner and sponsors CHF’s National Parent Club Canine Health Conference. The biennial event, which brings together CHF-funded researchers, veterinarians, breeders, students, and dog lovers, will be held August 9 to 11, 2019, in St. Louis, Missouri. Since 1997, Purina and CHF have shared a mission of supporting canine health research to benefit all dogs and their people.